Dave Prowse was born in Bristol in 1935, and attended Bristol Grammar School where fellow pupils in his year included actors Julian Glover and Timothy West. When he was 15, Dave Prowse followed the Charles Atlas bodybuilding course which helped to develop his fine physique. 6' 7" tall and very strong, he turned to weight-lifting with great success, becoming British Heavyweight Weightlifting Champion for three consecutive years. In 1969, Dave Prowse started up his own gymnasium, the Star Gym in Southwark, and became the personal trainer to a number of actors and actresses preparing for film roles. These celebrities included Christopher Reeve for his role in Superman, Daniel Day-Lewis, Robert Powell, Jason Donovan, Stephanie Powers and even Prime Minister Edward Heath! Such was his strength that Dave Prowse became the first man for over 100 years to lift the Dinnie Stones weighing 356 Kg! Follow the link below to find out more!! Dave's height and physique got him noticed and, after his appearance as a bodyguard in The Clockwork Orange (1971), George Lucas offered him a choice of parts in Star Wars - either Darth Vader or Chewbacca. "Everyone remembers the bad guy," remarked Dave and so began his long association with one of the most iconic villains in the history of films. 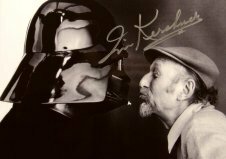 Prowse appeared as Darth Vader in Star Wars (later retitled Star Wars Episode IV: A New Hope), with Episode V: The Empire Strikes Back following in 1980, and Episode VI: The Return Of The Jedi in 1983. 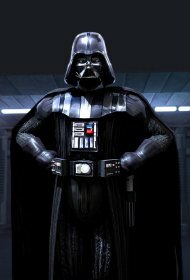 Because Dave Prowse has a soft-spoken West Country accent, George Lucas had Darth Vader's voice dubbed by actor James Earl Jones - something that still annoys Prowse to this day! At first, Prowse was not optimistic about Star Wars. As he says in his Swindon interview (see link below) "To be perfectly honest I thought it would be a load of rubbish. Although we'd all read the script it didn't make much sense. Plus I couldn't see where I was going on set and my eyepieces kept misting up so I was constantly taking the helmet off! The only thing I could appreciate at the start was how much money had clearly been spent on the sets - they were phenomenal." In 2000, Dave Prowse was awarded the MBE for his road safety work and also the part he plays in fundraising for arthritis charities (he himself has been a lifelong arthritis sufferer). 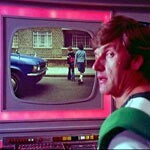 In 1975 Dave Prowse became the 'superhero' of the Government's Public Information films on road safety! Known as 'The Green Cross Code Man', Prowse's character uses his 'dematerialiser' device to appear instantly at any location where young people need to be shown how to cross roads safely. These short films were shown on UK TV between 1975 and 1990, created a great impression and reduced child road deaths significantly. Dave Prowse's other film roles are mainly of bit-parts ranging from Hammer Horror, a Carry On film and the James Bond spoof Casino Royale (1967). Dave Prowse has written a 2-volume book called 'Straight From The Force's Mouth', with an MP3 CD version also available. This is the subject of a revealing, forthright and humorous interview that Dave Prowse gave to Darren Rea - follow the link and enjoy this essential reading! From the interview you will know that Dave Prowse is married, with children and grandchildren - and why he has a 3' statue hidden behind his settee!!! 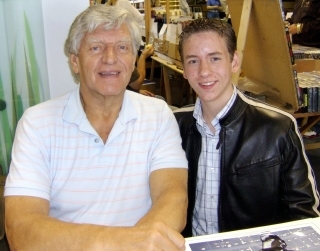 I first met Dave Prowse at Autographica in Coventry in 2004. He signed a photo for me and also a small Darth Vader bag. He said that he had not seen one of these before, but I don't know if he was really joking!! Dave was at Kempton Park for Starcon in September 2006 and this time I had my photo taken with him. 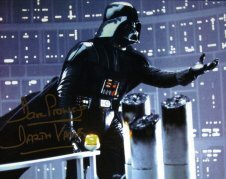 He also signed another Darth Vader bag - a big one this time!